Thank you Isabella and Mariacristina Oddero! I so enjoyed our dinner together! And a thank you as well to all of the guests who came out for it. The pricing for this dinner is $165/per person + tax and 20% gratuity. That price includes all food and wine for the event. Dinner to start at 7pm on Saturday, the 26th of February. Please email Alto Sommelier Levi Dalton at ldalton@altorestaurant.com for more information or to reserve a seat. Gary used to sing. He had worked at a popular musical supper club in Florida, so maybe he had started up the practice there. If no one was really around, like when we were polishing silver, he would really belt it out. But most times it was just sort of under his breathe. If you were standing pretty close next to him you could hear it. You would be waiting to order in an ice tea at the micros and there would be Bonnie Raitt or Diana Ross there with you. "Upside down" and then over by Pedro in the bread station "Boy, you turn me," while grabbing some sugar caddies "Inside out," and the two lattes for back out on the floor "and round and round." Diana was on a happy day. Bonnie would do shows when Gary couldn't find the manager to give him a void. That's when he couldn't make her love him if she wouldn't. Most lunches were pretty busy, and it was usually a flat sat in the station. Like 20 or 30 people would sit basically at the same time and you just had to deal with it. I would have dreams at night like I was waiting tables on Storrow Drive with roller skates on, and that it was my job to get more sodas for picnic table sized groups of diners while dodging the oncoming traffic. It could be tense. I once asked Gary why he sang and he had said "it helps me deal" and I think I know what he meant by that. Because Gary could handle it. One time the room had filled up in about 10 or 12 minutes flat, maybe there were 45 people at the tables and I was losing it. If you have been there you know how it is like having a sunstroke: you can't think, you can't prioritize, you're overwhelmed. Gary would just sing through it. He had come over to me that day, said "don't worry, Gary's here" and then just gone back out on the floor with a big smile and more than one song and we had both gotten through it. Or maybe he had gotten through it and I, like a tune, had been carried. I figure the songs helped Gary keep his rhythm. That's why he didn't get paralyzed with the waiter sunstroke. He would sing a song he knew well, he would sing it just about the same way each time, and that would help keep his timing in order. His sense of progression. That's how he could juggle all of those tables. That is why Gary was a great waiter, one of the greatest I have ever encountered. 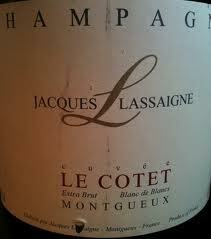 Recently, I drank a bottle of Lassaigne "Le Cotet" Champagne and I thought I recognized something in the texture of those bubbles. There was a tension there, a real tactile sense of anxiety. The flavors were roiling in the glass. But there was was also a whispered cadence to the wine that I appreciated. A persistance. The notes came out of the bottle in a flurry, but none were muddled. They were quite distinct. Ordered, but quiet. You had to carefully listen to make them out as they led from one to another, in time, until the moment, much later, when the chorus sang out. The Jacques Lassaigne website describes "Le Cotet" as "a mineral wine, very fresh, that exhibits lemony notes on the finish," but that doesn't tell you about the song that holds those pieces together. So I thought I would. That was one of the greatest Champagnes that I have ever encountered. Solaris is a film that greatly affected me. The 1972 masterwork from Andrei Tarkovsky seemed to revel in the possibilities of demonstrating emotion and resonance in a medium which can be limited by the inability to reveal interior monologue (or dialogue). A lot of people talk about Solaris as a science fiction story. Sometimes it is referred to as a love story. It is on occasion pointed out that some of the special effects imagery is quite impressive. There was a remake with George Clooney in it (from 2002) that emphasized all of those themes, and the clossal unimportance and forgettable nature of that second film only confirms for me that if one looks at the original Solaris as a sci-fi vehicle, or as a tale of lost love returned, that these views obscure the real impact of the film. Those lenses don't allow you to see the full picture. What the original Solaris does, and this is the technique that Tarkovsky returned to over and over again throughout the course of his career, is to use a mysterious setting where normal rules do not apply as a background to better show up the hinderances and difficulties and failures people encounter interacting with each other and their own emotions. This plays out against the passage of time and the loss that it renders, which can only be and is conteracted by our own memories, to sometimes terrible and ponderous effect. What we seek and intend is never what we find, and what we try to forget is what stays to shape our daily existence. Tarkovksy showed us a world which is never normal and never our own, where we can be terrible to each other and terrified of each other, but never alone. That is my view of the dominant theme of Tarkovsky's work, and I came to that view because like most subjects that I become interested in, I submerged myself deeply into it. I lived and breathed Tarkovsky. I saw every one of his feature films. I hunted down his student work. I read the backstories. I researched the actors. I watched other directors who paid homage to Tarkovsky. I viewed pieces about him and his work. I placed his photograph on my computer screen as a background wallpaper. I had become, if not obsessed, certainly preoccupied with his work. I had decided that Tarkovsky for me was one of the all time greats. More interesting than Bergman, Andrei Tarkovsky had used the medium of film in ways that only the mercurial Jean-Luc Godard could match. And he had offered psalms for our souls that only Antonioni could append. I had decided that Tarkovsky was monumentally important in the history of film that I had created for myself. I didn't watch a Tarkovsky film for 5 or 6 years. Maybe longer. I had made up my mind. I think that I stop learning at just about the same time that I make up my mind. I have decided. Everything is set. I know. What is the point of review? What in heaven, or earth, or film, can't be explained by my philosophy? Going back is only tedium and tautology. Except that recently I did go back. And there had been enough time in the interim that although I still remembered the broad strokes, I had forgotten the particulars. Which is right when you should go back. That's the time. Because that is when you can really see a subject anew, and learn something again. Knowing what the general arch is but looking once again to find it is how we can see rainbows. So I watched Solaris '72 again, and I did learn something. Or at least I thought something, which is maybe more important. In the beginning we find our protagonist, Kris, outside his family home. He watches the movements of a stream. The water pushes a leaf along a journey. It begins to rain. Kris heads back to the house. At the end of the film Kris would also return to this house. And it also begins to rain, but now we see that Kris is on an island on the surface of a distant water planet, far from earth. Of course, if you have seen the film, you know that this planet interacts with Kris. That it provides him with figures from his past. The question that one reasonably might ask is: when I saw Kris at the begining of the film, was he also on this same island? Did it rain so hard because so much of the surface of the entire planet is water? Is the entire movie a rendition of recall? How many layers of memory would one have to pull back to find the original instance? Think of it this way: say you had a couple standing in front of a photographer's camera. How much of this film was the couple standing there, that one time and in that one moment, and how much is the image that is taken? The image of the image? How much is the repeat vision after they are already gone? Those are the questions that I thought about 6 years ago. Those are the first questions that come to mind when the camera pulls back and reveals to you the water planet and the giant waves across its surface. But what I wondered this time was whether the foreign planet would have been a water planet if at some point it hadn't rained? If Kris hadn't watched a stream push a leaf towards fate, would the interaction have been with a water planet at all? Another space traveller to the same location had filmed only clouds. Say Kris had flown a kite instead of watching a stream, would he have also seen clouds? What if the entire shape and structure of the planet had been determined by Kris' history, as were the visitors that he found himself with? How much of this world did Kris create through his own preoccupations? So I saw something new, something that was pivotal, and I understood it because I returned to the subject after letting it go. Tonight this same phenomenon happened to me again, but it involved Condrieu. I no longer drink much Condrieu. I went through my Condrieu phase. My fascination with Chateau Grillet. My coming to terms with the question of ageability. 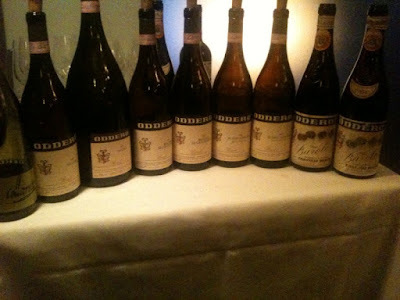 My search for the minerality inside the lush fruit. I had had done with Condrieu. I knew Condrieu. And so I forgot about it. For years. I went to aromatic red wines. To orange wines. To sherry. Condrieu was not enticing. This evening someone asked me for a pairing with their polenta and cockscomb ragu. This dish is a quagmire of lost pairing hopes and dreams. It is theoretically a red wine dish, as the cockscomb is braised in red wine, but then it doesn't taste that great with red wines. It sort of goes through them, often enough. At the same time it takes crisp and lean whites and matches with them much the same way as a speeding car matches with a brick wall. The taster is the crash dummy. On a whim I paired an aged Condrieu with the dish. The patron was pleased. He had not drunk a Condrieu in some time, perhaps even thought of Condrieu with a certain dislike. But he suspended disbelief as the interaction resonated beautifully. And that is when I realized that a pairing is as much about texture as it is about flavors. The rich and supple Condrieu flowed with the texture of the polenta and its deep braise. It didn't matter that the Condrieu was redolent of peach and honeyed chamomile. The tasting note didn't matter. It took thinking that I knew, and then forgetting and going back, to make the realization. I wonder if it would have been different had it rained?